I’m always looking for ways to check my credit report and credit score for free. 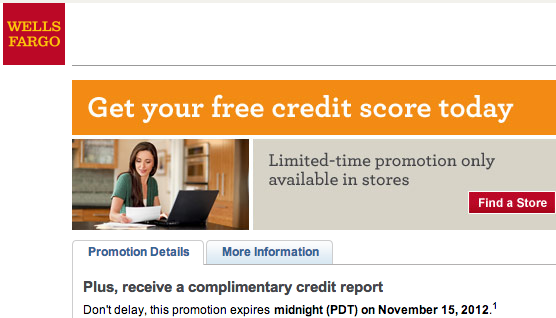 Wells Fargo is currently offering their customers a free credit score and report from Experian. See here for more details. From now until midnight November 15th, 2012, you can walk into any Wells Fargo bank to pick up a personal access code. Once you get your code, go here to enter your personal information to verify your identity. 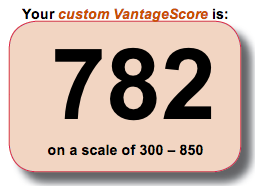 Within seconds you can get your free credit score ($12 value), evaluate it for errors, and review factors that affect your credit score. My mortgage refinance with Cash Call was recently sold to Wells Fargo. Since there is a bank location directly across the street from my office, I walked in during my lunch hour to speak with a personal banker and pick up my access code. Don’t forget to write down your credit report number if you want to review your credit score and report within the next 90 days here. To take advantage of this offer you just need to have any product of Wells Fargo (checking, savings, money market, investment, mortgage, credit card, etc).